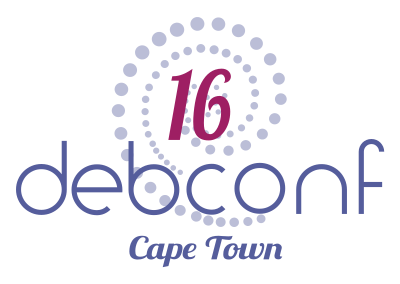 DebConf16 will be held this and next week in Cape Town, South Africa, and we're happy to announce that the schedule is already available. Of course, it is still possible for some minor changes to happen! The DebCamp Sprints already started on 23 June 2016. The full schedule of the Debian Conference thorough the week is published. After the Open Festival, the conference will continue with more than 85 talks and BoFs (informal gatherings and discussions within Debian teams), including not only software development and packaging but also areas like translation, documentation, artwork, testing, specialized derivatives, maintenance of the community infrastructure, and other. Debian thanks the commitment of numerous sponsors to support DebConf16, particularly our Platinum Sponsor Hewlett Packard Enterprise. Hewlett Packard Enterprise actively participates in open source. Thousands of developers across the company are focused on open source projects, and HPE sponsors and supports the open source community in a number of ways, including: contributing code, sponsoring foundations and projects, providing active leadership, and participating in various committees. Our first Platinum sponsor is Hewlett Packard Enterprise (HPE). HPE is one of the largest computer companies in the world, providing a wide range of products and services, such as servers, storage, networking, consulting and support, software, and financial services. Our first Gold sponsor is Valve, a company developing games, social entertainment platform, and game engine technologies. Our second Gold sponsor is Google, the technology company specialized in Internet-related services as online advertising and search engine. Rusbitech (developers of the Astra Linux Debian derivative), credativ (a service-oriented company focusing on open-source software and also a Debian development partner), Catalyst (a company offering IT solutions using open source software), the Bern University of Applied Sciences (with over 7,000 students enrolled, located in the Swiss capital), and Texas Instruments (the global semiconductor company) are our four Silver sponsors. And last but not least, the open source company Univention has agreed to support us as Bronze-level. Please have a look at our sponsorship brochure (or a summarized flyer), in which we outline all the details and describe the sponsor benefits. For further details, feel free to contact us through sponsors@debconf.org, and visit the DebConf16 website at https://debconf16.debconf.org.